12-26-06 — CR!FR will join Metro Cat Action Team at their Adoption Fair on Saturday, Jan. 27, 2007 from 12-4pm at Webers Pet Supermarket, in Fairfax. Griffin, Geordie, Galen, Tashi, Gimli, Windham, Josie & Jessie, Raena, Xylo, Killian & Korey will all be there. C'mon out & meet the gang! 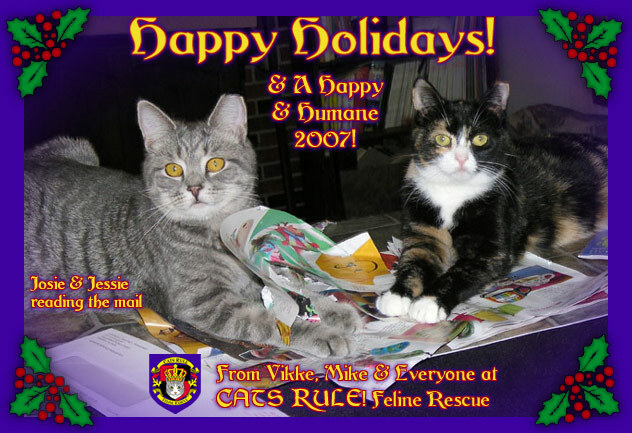 12-24-06 — HAPPY HOLIDAYS to Our Fellow Friends of Felines! Whichever holiday you celebrate, we hope it's warm, happy & peaceful. Best wishes for a successful & satisfying 2007. Sincere Thanks to our many friends & supporters who lent a hand, sent a check/PayPal'd, donated supplies, rescued/fostered cats, helped with the 501c3 application process, attended events, helped with vet care, scooped boxes, etc at HQ, took in cats for us, purchased our wares, and did so much to help CR!FR in 2006! Your help, participation, friendship & spirit are greately appreciated. Looking forward to working together to help our feline friends. Thank you for being a friend to animals! 12-22-06 — FANTASTIC NEWS! Geordie, Galadriel & Griffin have been re-tested for FIV/FLeuk & they are NEGATIVE! Back in July they tested a weak positive for FIV. The vet advised us to have them re-tested in 6 mos because the positive reading was likely a matter of their mother's antibodies registering on the test. Sure enough, 6 mos later the antibody traces were gone. Hooray! 12-21-06 — The statistics are now in from Alley Cat Allies' monthly feral cat clinic: A total of 696 feral cats were altered in 2006! Over 108 colonies were served by 20 veterinarians and over 100 volunteers. Here's hoping next year's figures will be DOUBLE! Remember, if you see or know of homeless cats outdoors, TAKE ACTION! CR!FR is here to help. 12-14-06 — Please join us for Metro Cat Action Team's Adoption Fair this Saturday Dec 16. from 12-4pm at Webers Pet Supermarket, 14508-G Lee Rd. in Chantilly, 703-631-2738. Thanks MCAT, for inviting our kitties! C'mon out & meet Josie & Jessie, 2 of the cutest, sweetest kitties ever! 12-10-06 — We brought 6 cats to the ACA Feral Cat Clinic today. An interesting cat came through from an other colony: a big polydactyl tom with SEVEN toes on each front foot. A total of 74 feral cats were spayed/neutered, vaccinated for distemper & rabies, dewormed & groomed today. Eighteen came from the Manassas landfill. Also, I heard from Lori of MetroFerals, who kindly took the beat-up emaciated cat we rescued from the salvage yard into her care (see 09-17-06 news below). Lula is now doing well & has healed up nicely! Lori said she's small but is filling out nicely & is actually friendly. Thank You Lori, for taking care of this poor neglected kitty when CR!FR was unable to. 12-09-06 — Our "Holiday Giving Tree" is now up at Town & Country Animal Hospital in Fairfax City! It's a great way to donate much-needed supplies to needy cats. It's easy: you take a snowflake ornament off the tree, purchase the item(s) listed on the front & bring it to Town & Country to set by our tree. The items range from canned & dry cat/kitten food to humane box traps to heated cat beds to cat litter, etc. Monetary donations & anything from our Wish List are also much appreciated. 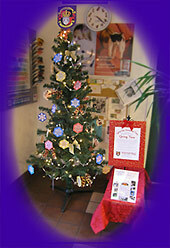 Please stop by & see our tree & consider donating a gift for needy cats. Thank You to Dr. Reed Hall! 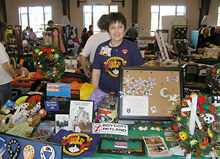 12-04-06 — We had a great time at FFGW's Holiday Bazaar for the Animals! Lots of cat rescue groups attended, it was great to be around so many cat-people! The goods & crafts for sale were beautiful & very high-quality, mostly cat- & pet-themed items of every kind. The silent auction & raffle had lots of neat prizes & the sweets counter was stocked with fabulous homemade treats. Thank you to everyone who visited & shopped at our table! Looking forward to next year! **Keep an eye out for our "Holiday Giving Tree" coming soon to Town & Country Animal Hospital in Fairfax City! 12-01-06 — Please join us at the Feline Foundation of Greater Washington's Holiday Bazaar for the Animals! In addition to our unique & charming Gifts for Cat-Lovers, there will be Antiques, Gifts, Crafts, Other Rescue Groups, Christmas Treasures, Cat-Themed Items of Every Kind, Silent Auction, White Elephants, & much more! 3313 Arlington Blvd (Rte 50) at N. Jackson St.
11-23-06 — Wishing Everyone a Happy & Humane Thanksgiving! Many heartfelt thanks to everyone who has supported & helped CR!FR this year. You are appreciated more than you know. Thank you for your caring spirit! Special shout-out to Phil N. - heaps of thanks for all your dedicated help with the Baltimore kittens! Please visit United Poultry Concerns for important info about turkeys & other birds. 11-19-06 — A BIG HUG & T H A N K .Y O U to everyone who came out to the Rockin' Benefit last night! THANK YOU all the musicians who donated their time & talents, everyone was excellent! THANK YOU to Pam of Dewey Animals for inviting us to participate, it was a blast! THANK YOU to everyone who donated raffle prizes! THANK YOU to everyone who bought raffle tickets & items from our booth! THANK YOU Rhodeside Grill & Chuck Levin's Music Center! 11-14-06 — A THIRD raffle has been added to our Rockin' Cat Rescue Benefit this Saturday - For a GUITAR! - The model is still TBA but it will be a FENDER! Click here for more info - there are so many prizes you're almost guaranteed to win something cool! Please join us, it's going to be a lot of fun! Thank You to Chuck Levin's Music Center! 11-10-06 — Click here to find out more details on our upcoming ROCKiN' BENEFiT & to see the list of Fabulous Raffle Prizes! Hope you can join us! — UPCOMING EVENTS: CR!FR will be partnering with Dewey Animals, an other fine cat rescue organization, for a rocking fundraiser on Nov. 18 at the Rhodeside Grill in Arlington. Playing live will be Wicked Jezebel, Susan Souza, Third Wish, Bloody Meri, & Cover Up. Stay tuned for more details! — Need a gift for a fellow cat-lover? CR!FR will have on sale our wonderful & unique creations for cat fans at the Feline Foundation's HOLIDAY BAZAAR FOR THE ANIMALS! Join us on SATURDAY, DECEMBER 2 from 9:00 am - 3:00 pm at Faith Lutheran Church in Arlington, 3313 Arlington Blvd (Rte 50) at N. Jackson St. Hope to see you there! felines & animal-people! We currently have in production a great selection of adorable hand-made ornaments. Keep an eye on our Shop page for details coming soon. We've brought back our smash hit Holiday Kitty Wreaths, in addition to the other neat gift items on our Shop page. Don't forget to treat yourself to a nice gift: you deserve it AND your purchase supports our rescue efforts. 10-13-06 — Thank you to everyone who stopped by our table at the Fall for Fairfax Festival! Gorgeous weather, a great turnout & lots of animal-friendly people made it a terrific success. THANK YOU from the cats of CR!FR, for your support! 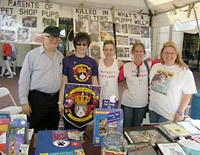 And THANK YOU to Holly & PetstoreCruelty.org for inviting us to share the booth. 10-06 — THANK YOU & HUGS to Gin R., for the donation of life-saving kitten meds! Your generosity & kindness will save many little ones. 09-24-06 — A remarkable change has come over many of our shy ferals at CR!FR HQ this year: I call it the The Thawing of the Ferals! Many of our shy guys & gals are overcoming their fear & warming up to us. Ares in particular is amazing: he has always been super-affectionate to the other cats & especially dogs, but has never had the nerve to befriend a person. Now he's a demanding love monger who you can't get by without petting him & scratching his chin. He will even sit in our laps! Bruna is standing up to the cats who intimidate her (Fluffy) & is more comfortable with contact & affection; Zephyr now loves attention; Alfie went from friendly to shy & now trying very friendly again; Guinness & Finnegan have always been a little reserved but now are very affectionate, just try getting Guinnie out of your lap when he's on a roll; MoonPie has her very sweet moods when she squeaks softly for attention. She even lets Kate pet her! Tuffy is now more confident & relaxed & is much more friendly & affectionate. Chip is also a special case who went from very feral to a sweet loving affectionate friend. You can't enter the upstairs cat room without spotting Chip on the upper bunk & giving him some love. Bandit is now a top-bunk love hog, too. Samson now allows contact & purrs for chin rubs. And Freckle is the sweetest, wiggliest love-monger of them all! I predict that Eric will be the next to jump on the feral-to-friendly bandwagon. He loves to play & seems to want to be friends. Now if Saba, Mitra, Shadows, Sheba, Ocho, Phantom, Flash, Goldie & Luna become friendly I will have seen it all! 09-17-06 — We brought 1 cat from a salvage yard in Frederick, MD to the ACA feral cat clinic. This poor cat is in terrible condition. She was trapped a week ago by a fellow who frequents the scrap yard. The poor thing had 3 kittens in the trap a few days ago but sadly, they were crushed & didn't survive. She is very thin, has a strange skin condition on her face, & her forearms & dewclaws are all raw & cut up. I'll post an update on Lula as soon as I find out how she's doing. 09-10-06 — With much sadness I report the unexpected passing of our little Gamma. She was at the clinic for spay surgery but didn't recover. The necropsy determined that she had "separative pneumonia". She was only 6 mos old & was outwardly healthy & doing fine. Gamma was one of the Baltimore 7 who were rescued from "euthanasia" at the crowded Baltimore shelter by friend-of-felines-extraordinaire Phil N. They were brought to CR!FR on Memorial Day & have been charming all who meet them ever since. Gamma was the only shy one & was just getting over her shyness & becomming really friendly & affectionate. We miss you, little Gammagirl! 09-07-06 — BARN HOMES & FOSTER HOMES are still NEEDED! Please contact CR!FR if you can recommend/offer a barn home for our needy spayed/neutered/vaccinated feral cats. 09-04-06 — It's official - We have been granted 501c3 non-profit status by the IRS!! CR!FR will be able to accomplish a *lot* more for homeless cats because we're now eligible for grants, and donations are tax-deductible! As soon as we can pay down our $10K+ vet debt accrued in August, it will be full speed ahead. THANK YOU to our hard-working team of Board Members & friends who helped us achieve this goal: Vikke, President; Kate, Vice President; Katrina, Treasurer; & Laurice, financial specialist. Thanks also to Mike A., Bob & Barbara B., Jeff Z. & Bruce B. for their encouragement. Please help us celebrate this milestone & help us get back on solid financial ground with a tax-deductible donation! We can't rescue homeless cats who have no one to care for them & no home without you. Help us give them hope! As always, our PayPal account is set up to accept donations (www.paypal.com - info@catsrule.org) or you can send checks or money orders to CR!FR, PO Box 2096, Fairfax, VA 22031. Material goods are also appreciated, especially cat food, litter, cat trees/scratchers, bleach, laundry detergent, paper towels, & PetSmart/Walmart gift cards. There are already many easy ways to help CR!FR help cats - some don't even cost you a penny! Click here to find out more about our igive.com, Goodsearch.com, cashforcritters.com, & our magazine fundraising programs. 09-2,3,4-06 — We attended the Humane Society of the US's Taking Action for Animals conference with our friends anti-puppy mill advocacy group PetstoreCruelty.org. It's wonderful to be in an environment where everyone around you is an animal-person! We met lots of great folks & gathered plenty of printed info to share at our tabling events. 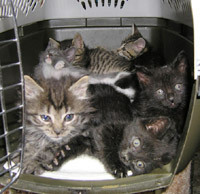 08-20-06 — We brought 16 kittens of various ages from a residence near the Springfield mall to the ACA feral cat clinic! We took 4 into our foster program, an other rescuer took 1, & 2 rescue groups took 3 (THANK YOU Cindy, Katrina, AdvoCATS & Fancy Cats! And Stacey for working on this colony). Unfortunately later that evening, our precious kitten Wonder developed a setback & he left this world at the emergency vet. We miss you, sweet Wundie! The other kittens are doing well, fortunately. This situation has caused us to put the breaks on rescue & TNR temporarily because we are out of room & at capacity. But we can continue to help people who need help with TNR, as long as they can house the cats before & after the feral cat spay/neuter clinic. 08-14-06 — The Baltimore kittens, Windham & Yelena have all come home! The sunroom is extremely spotless & spacious now that there's very little in it. The vets have recommended the kittens be housed in individual crates for 6 weeks so their diets, feces, & general health can be monitored. 08-05-06 — A situation that all rescuers dread began to unfold on this day: the deadly virus panleukopenia struck 2 of our precious kittens Wagner & Wander. We raced them to the emergency vet but Wagner didn't survive long Wander hung on for 3 days before we tearfully let him go to the other side. Our hearts are broken, we miss our poor sweeties Waggie & Wandie. This crisis affected all the kittens in the sunroom, as they were exposed to the kittens who got the virus. Windham & Wonder were taken to the emergency vet for pre-emptive treatment. The 7 Baltimore kittens & our bunny Yelena were boarded in isolation at our regular vet while we removed everything from the room & coated every inch of every surface with a bleach solution to kill the virus. Twice. I visited the kittens & bunny at both vets almost every day they were there & called for updates at the emergency clinic every 4-6 hrs. Windham was cleared to come home after 3 days at the emergency hospital. Wonder stayed on for 8 days, then stayed at our regular vet for 3 days to finish up his anti-biotics. We were overjoyed! He did fine the first night he came home. 07-16-06 — We brought 3 kitties from Manassas to the ACA feral cat clinic, thanks to CR!FR trapper Chris W. One was an adult feral cat, the other 2 were kittens, about 3 mos old. We'll keep the kittens, socialize them & find them loving homes. Update: Meet Josie & Jessie! 9230-B Old Keene Mill Rd, Burke, VA 22015, 703-455-2007. Hope to see you there! 06-25-06 — We brought 1 cat from Ashburn Village to the ACA feral cat clinic. But I left with 3 kitties: 2 6-wk-old fluffy tortis were brought to the clinic from Apple Mountain, near Front Royal. They were living with a colony of feral cats under an elderly woman's deck. I felt they were too little to be returned, & too precious! So I brought them home to socialize them & plump them up, the poor babies are quite skinny under that fluff. Update: Meet Isa & Izzy! 05-29-06 — Memorial day - We shared a table with Action For Animals Network at the Chirilagua Festival, a pan-Latin gathering in Alexandria. It was nice to try to reach a different audience. Later that evening I received 7 kittens who were slated for "euthanasia" at the Baltimore Shelter. The poor angels are only about 6 weeks old & are all sick with URIs (upper respiratory infection) but are very friendly & sweet. 05-21-06 — We brought 9 feral cats to the ACA feral cat clinic: 2 from Vienna, 2 from Manassas, 4 from Springfield, & the Warrior Princess, mama of the 4 kittens, from Manassas. 05-6-06 — CR!FR shared a booth with anti-puppy mill group PetstoreCruelty.org at the Reston Pet Fiesta, which we enjoyed when the wind wasn't blowing our table away! What a fun gathering of dogs big & small & their people. Several cat groups attended as well, such as Alley Cat Allies. 04-09-06 — We brought 11 cats to the ACA feral cat clinic: 2 from Vienna, 3 from Manassas, 2 from Ashburn Village, & 4 from Chantilly. 04-04-06 — Ohmygoodness! What a surprize: A feral cat that CR!FR friend Margaret had trapped & brought to me for this weekend's feral clinic had 4 kittens! She's being held in a crate because the clinic isn't for 5 days; so she had room to make a nest behind her hiding box. The kittens are adorable, of course! But mama is very feral & I can't handle them much just yet. Mama's taking good care of her babies. She'll go to next month's clinic instead of this weekend's. 03-26-06 — I attended a Neo-Natal Kitten Care Class hosted by one of our area's most accomplished kitten rescuers. It was a very informative & thorough seminar. Susan needs help with her kitten program as she's had to cut back recently. If you are willing/able to help new-born orphaned kittens, Susan is available to assist you. These kittens require specialized care & she is an expert. Please contact CR!FR if you can help & we will put you in touch with Susan. 03-15-06 — BARN HOMES & FOSTERS NEEDED! We were fortunate to find a generous barn owner to take 4 feral cats that needed to be relocated due to unsafe conditions. We have a constant need for additional barn homes to accept relocated feral cats. Please spread the word & help us find good barn homes for our ferals. 03-11-06 — FREE FERAL CAT SPAY/NEUTER DAYS in Charlottesville, VA - on March 25, April 22, May 20 — FREE! Cats will be sterilized and vaccinated at no charge. Appointments required, no drop-ins. Call 434-979-1200 or e'mail feralcats@voicesforanimals.org to make appointments and to reserve humane cat traps. 01-30-06 — With much sadness I report the passing of our friend Cairo. Cairo was one of our early feral rescues from the New Jersey Turnpike reststop. He never got even close to friendly but he did come a long way from when he first arrived. I know he had a happy side he kept hidden from humans. For more info, see his page here. Take care, Cairo. We miss you. 01-20-06 — Happy New Year! We hope you had a relaxing & peaceful holiday. A lot has been happening here at CR!FR & I've fallen behind on keeping you informed via this page. -- Firstly, we are in the process of applying for non-profit status - meaning we will soon be a licensed 501c3! Many, many thanks go to Laurice G. for her help. -- CR!FR has many terrific developments & programs in the works, which I'll be able to tell you about soon. It's going to be a very active year, with more fundraising & adoption events in addition to TNR & cat rescue. We hope you'll join us because we'll need help! We have a big backlog of cases needing assistance & practically no funding to help the needy cases. We'll need your help with fostering, adoptions, events, fundraising support, rescue, TNR, etc. Hope you'll find time to join us because we will be asking! -- a new e'mail client has made tracking & keeping up with requests for assistance much easier. Hopefully I won't fall behind & out of touch as much & will be able to respond quicker & help more cats faster. On the other hand, I'm working almost FT again, so time is tighter. -- We have a small but terrific group of TNR trainees interested in helping us help you help cats. Hopefully we'll be able to help more cats more often & faster. There's always plenty to do, it's a work in progress! But progress deserves a mention & there's more on the way. We'll keep trying to keep up with the constant avalanche of animals needing help. Let's hope this year we'll be able to take great steps forward, accomplish more than we'd hoped & help more homeless cats than we'd imagined.